Priscilla is a crossbreed of a Dragon and some other Being, cast into the Painted World of Ariamis because of what she was. The player can discover her doll in the Undead Asylum on their second visit, which allows them to enter the portal to the Painted World - the massive painting in Anor Londo. She stands in the tower at the edge of the ruins in the Painted World and watches over all who share the world with her. She is said to have acquired an unexplained power called Life-Hunt, an ability only she can wield, and she is said to be so powerful that the gods feared her, presumably the reason for her exile. Priscilla is not hostile and she does not have to be defeated in order to leave the Painted World of Ariamis, but once aggroed, she will remain so and killing her is necessary to leave. At the end of the area, behind the Heavy Knight. If you choose to attack her during your first visit to the area, you will be unable to leave until she has been killed. Make sure you're up to the task before attacking, or you will forever be stuck in the painting. Attacking and killing Priscilla is counted as a sin, but it can be absolved. If you keep her alive you will have an area that will always allow you to be invaded in. If you want to obtain all rare weapons, you'll have to kill her, for her unique soul as well as for the dagger dropped when cutting her tail off. Only once is necessary. It is possible to attack her and obtain her dagger without killing her. Warping into the Painted World once you've obtained the Lordvessel allows you to use Homeward or a Homeward Bone to exit the world provided you do not rest at the bonfire. Use the bone after cutting her tail. Requesting absolution from Oswald will de-aggro her for subsequent visits as well. 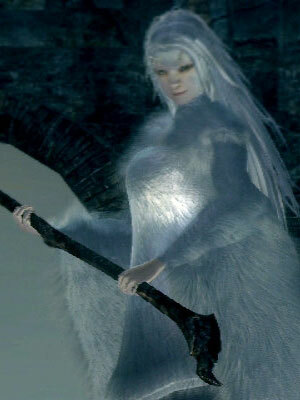 Very rarely, when you kill her with only one hit, the game will enter a softlock, where Crossbreed Priscilla will endlessly repeat her last lines of dialog "Ahh… But, why… What seeketh thee? ", preventing the cutscene that plays when you leave the Painted World from playing, making your game literally unbeatable if your last bonfire was the Painted World bonfire, as you can never leave the painted world again. PC players can use tools such as Cheat Engine to teleport themselves out, however. Invisibility: Casts a blizzard attack in the beginning that turns her completely invisible. this can be solved by hitting her, while invisible, with a fireball pyromancy. Scythe swing: Swings her scythe and sometimes a follow-up swing or two, it has a decent range and causes heavy bleed buildup. Blizzard: Blows a blizzard type attack, medium range, and is easily dodged by running to the side. Priscilla is initially not aggressive which allows you to get the first hit in, make it count. If going for her tail you should aim to hit that. You can utilise Power Within and/or Red Tearstone Ring to maximise this initial damage. A strong enough weapon two-handed may even kill her outright. Once aggressive she will go invisible but her footprints are visible in the snow, use these to determine her location to attack. She will break out of invisibility once staggered which is not too difficult to achieve. High bleed resist is recommended as her scythe will deal tremendous damage if you take too many hits. While she is invisible it is impossible to determine what attack, if any, she is performing, making it very difficult to dodge. Most Normal Shields and Large Shields should be sufficient for blocking however your objective here should be to go all-in and stagger her. Once she is visible she can be blocked or dodged as normal. A Spear, preferably lightning (such as that found in Sen's Fortress) is perfect for this fight. The lightning makes it very easy to stagger her to break her stealth and you can keep your shield up to block any attacks. You may wish to stand in the middle and wait for her footprints to appear or you can run to the edge to keep all avenues of approach on your screen. If you prefer a more direct approach, two-hand your weapon and the moment you see her footprints just roll up and hit her. You should stagger her after a few hits and will have an easier fight from that point. Some decent armour is recommended for this. A third option is to block and face her footsteps (or stand with your back to the fog gate), wait for her to bounce off your shield and then retaliate. Depending on the range of your weapon you may need to step forward a bit. A weapon such as the Caestus that deals light and fast attacks may not stagger her but allow you to kill her without her breaking invisibility. If you have any variation of Firestorm or Wrath of the Gods you can simply cast this once she turns invisible. She will be staggered and will turn visible for you to fight as per normal. Other spells such as Force may also work but you will need to wait for her footseps first. If not you are best off using a melee weapon to stagger her, see previous section. Once she is visible it is a simple matter of backstepping from her attacks and hitting her with your strongest projectiles. It is worth noting if you can hit her with a bow, the arrow will remain visible and telegraph exactly where she is. Apart from aiming above her footprints, you can also hold a shield up with the fog gate to your back and when she attacks, run to the other side of the arena and fire an arrow back at the fog gate. A few arrows can even stagger her, depending on the strength of the bow. You can apply Toxic to her with dung pies without making her hostile. You can then watch her die in peace. In case of Priscilla, the tail has about 17.17% of her HP. The first is while she is passive, this allows you to prepare as much as you like and get a perfect hit in with your strongest attack. Using damage boosts such as Power Within and perhaps Red Tearstone Ring will improve your chances of cutting it in a single hit. The second is while she is using her ice breath, block or dodge her scythe attacks until she uses it then run around behind her. Her tail should remain still for the duration of this attack. Additionally if using any version of Firestorm this has a chance of cutting her tail while she is invisible, particularly if you did a lot of damage to it before she went invisible. One hit using Pyromancy - With +5 Ascended Pyromancy Flame and Great Combustion, equip Crown of Dusk, Bellowing Dragoncrest Ring and Power Within (can replace any of those with Red Tearstone Ring on low hp). You can sever her tail in a single cast and follow up with any variation of Firestorm to finish her. Warning: this strategy may break your game!!! Contingency for a missed first try - Crossbreed Priscilla ceases to be invisible after taking high amounts of poise damage. A non-upgraded Ultra Greatswords, Greataxes, and Great Hammers all do 76 Poise damage with a 2 handed R1. 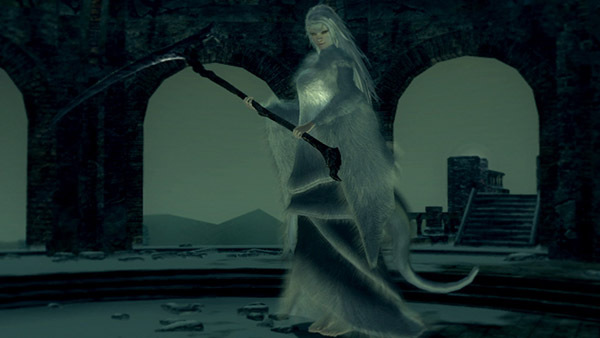 In a sample size of 1, two subsequent hits from a non-upgraded Greatsword of the class Ultra Greatswords caused Crossbreed Priscilla to drop invisibility while dealing a total of 144 damage, a fairly small portion of her total health. This data suggests that doing between 77 and 152 poise damage will cause Priscilla to drop her invisibility. Refer to the Poise page for reference to high poise damage options if you have insufficient strength to two hand an ultra greatsword, greataxe, or greathammer. Punching is one option. If you did not get the tail cut on your first try, this seems to be a reliable way to gain visibility of her tail if you missed the first opportunity to cut the tail before she becomes aggro. One of us, thou art not. plunge down from the plank, and hurry home. thine desires shall be requited not. This land is peaceful, its inhabitants kind, but thou dost not belong. I beg of thee, plunge down from the plank, and hurry home. I expected as much from thee. Why dost thee hurry toward thine death? But, why… What seeketh thee? Why could thou not let us be? Didst thou not see why Ariamis created this world?